Peter Howman, Managing Director, Defence Housing Australia. 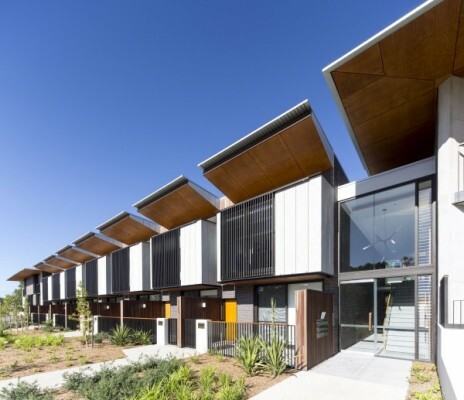 Bates Smart’s latest multi-residential project, for Defence Housing Australia (DHA), is an exemplar of how to build marketable housing that is functional, energy efficient and beautiful. 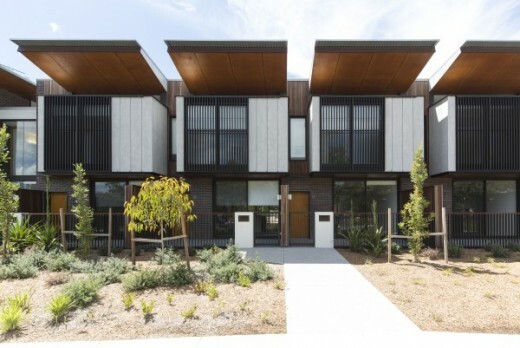 ‘Its rarity in the market has been reflected in sales, the community’s engagement, and with the ongoing accolades that the development enjoys,’ Howman said. 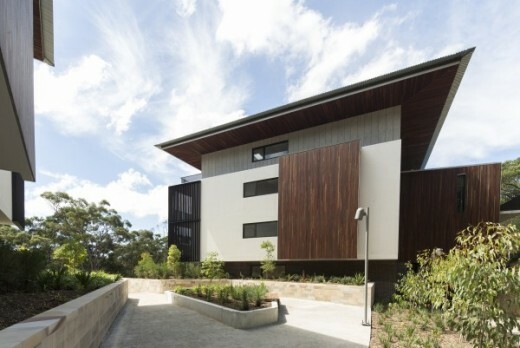 ‘Tubbs View + Hamilton Corner is a flagship development for DHA — not only because of the location, architectural and historical significance (the project is located on the grounds of the Sulman Award winning UTS campus in Lindfield) but because it is DHA’s first apartment project in Sydney,’ he said. 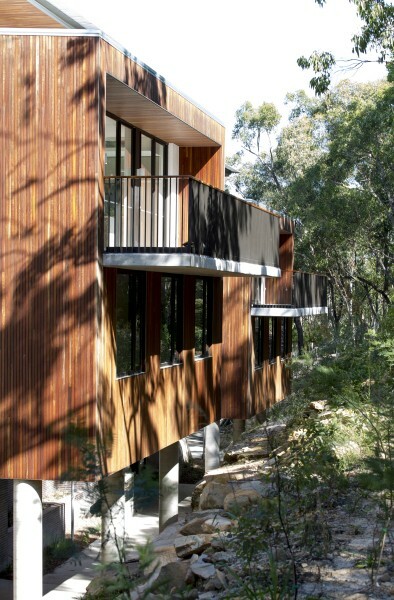 The project celebrates its bushland setting with treehouse-style apartments suspended over sandstone cuttings and dual-aspect, single-level apartments floating within the trees. Internally, the warm glow of timber, the subtle, raw surfaces, and abundance of natural light through clerestory windows create a contemporary and sophisticated ambience. 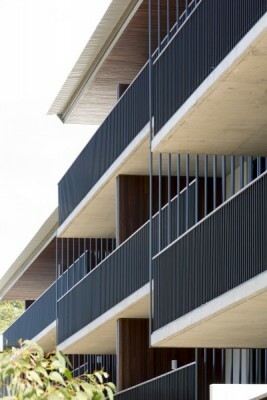 Courtyards, bush paths and communal garden spaces connect the apartments with each other and the rest of the precinct, while clever screening and plantings provide privacy without fences. 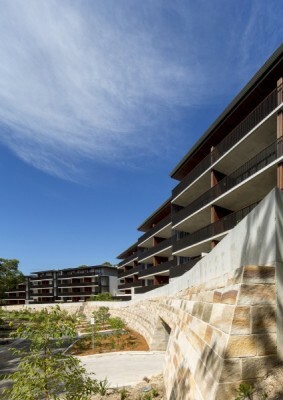 The stepped building design and integrated sandstone wall are an innovative design response to the unique constraints of the particularly complex site. 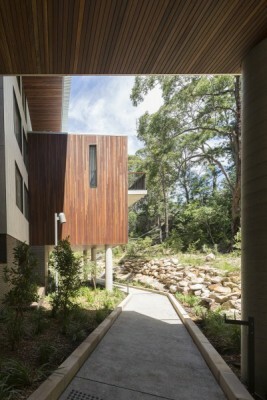 ‘We aimed to design a development that has a unique relationship with the bushland context with minimal impact on the landscape,’ said Guy Lake, Director, Bates Smart. 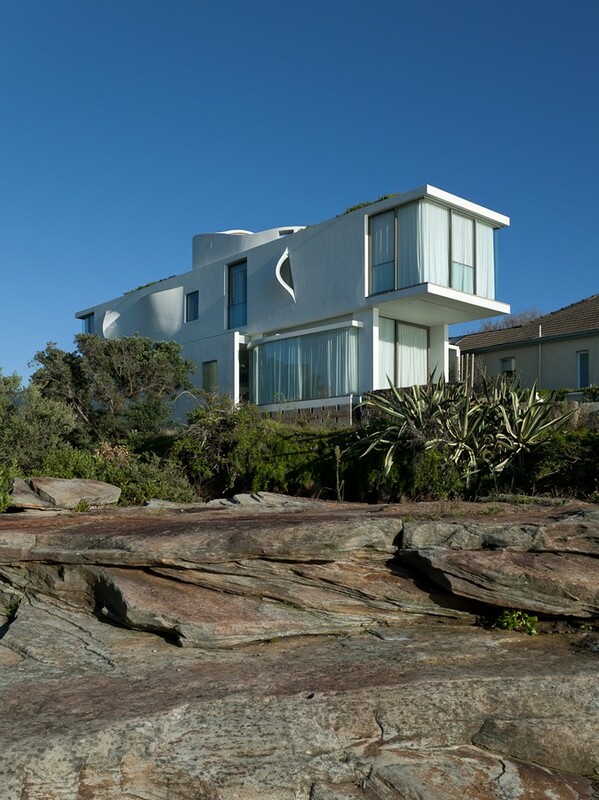 ‘We selected robust natural materials such as unpainted concrete and timber that sit well within the bush and are low maintenance. However, it was important that the end result was still warm and welcoming — it feels like a comfortable, appealing family home,’ said Lake. The 93 apartment development provides families with a level of functionality and comfort you wouldn’t usually find in a multi-residential development. ‘At the heart of the building, are some simple design principals, which provide some of the highest standards of internal amenity and environmentally responsible design available in the market today,’ said David Tordorff, Project Leader and Associate Director, Bates Smart. ‘The use of multiple lifts and entry points significantly reduces the need for internal corridors and increases the amount of apartments with a dual aspect. 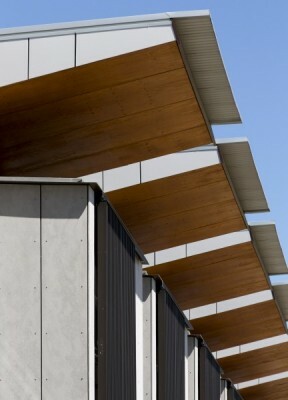 This in turn, gives residents a better outlook, and increases daylight penetration and cross ventilation. The design also aims to establish a new integrated community connected with bushland trails and elevated walkways, and interconnected communal spaces that promote community interaction and wellbeing,’ he said. 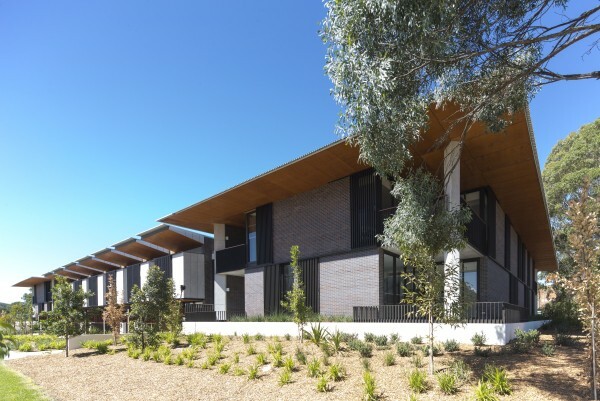 The project is also one of the first residential developments in NSW to undertake formal EnviroDevelopment accreditation, achieving the highest 6 leaves rating. The building is less reliant than traditional developments on artificial heating and cooling, and the apartments enjoy more sun in winter and remain cooler in summer through cross-ventilation and shading. ‘We are immensely proud of this development. 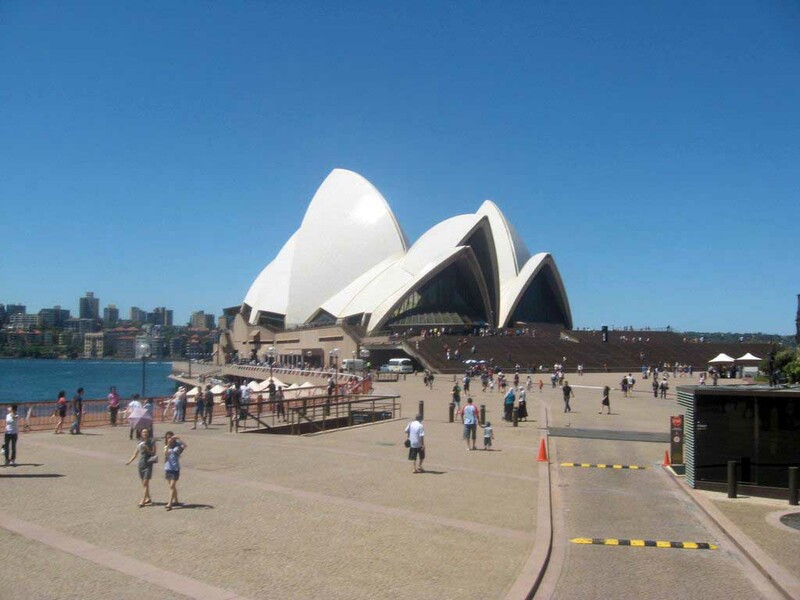 It is proof that historically significant and challenging sites can be transformed into thriving and liveable spaces effectively and respectfully through design, innovation and teamwork,’ said Howman.